And for all the deets on how to join this month’s challenge and have the chance to WIN a $30 gift voucher stop by Scrapbook Boutique blog, you have until the end of June to join us! Not sure that I’ve ever stamped black flowers before, but I am kinda liking the boldness and I decided to try embossing the Delicata gold on the stencil stripes and it seemed to work a treat! I love your card Therese! Can you do a video on this card please?! Would love to see your process in the making of the card. Please and thank you! We must have had sort of the same idea where the inspiration for the lay-out came, just wait and see my card in two weeks. Lovely, lovely card, Therese! 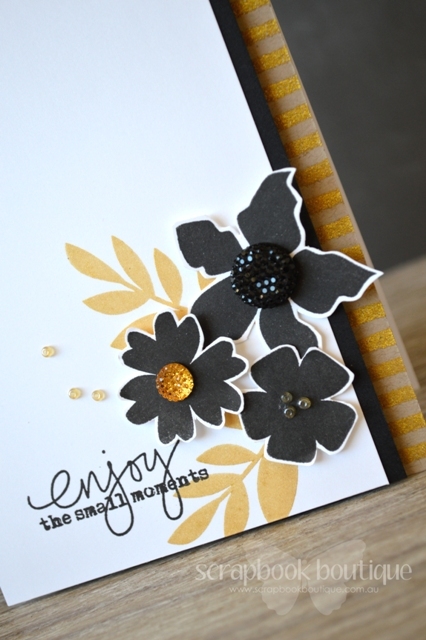 Dramatic and gorgeous, Therese… love the gold on kraft! Wowza! wow wee this is gorgeous.. love everything about it..
Beautiful. (I say that alot!) Love the mix of gold and black flowers. Oh my goodness, I am flipping out over this amazing card, Therese! So much love for those black flowers with the gold accents!! Color me silly, but I LOVE a black flower and you’ve created three gorgeous blooms, Therese! I also love the gold leaves and how you added the gold stripes to the border! Stunning and elegant…Love it to pieces! A very stylish card indeed! Black and gold are a match made in heaven! My goodness, I looked at the inspiration photo, which is beautiful, but it had me stumped for sure. Then I saw your card and thought, “perfection!” I would call it modern elegance. 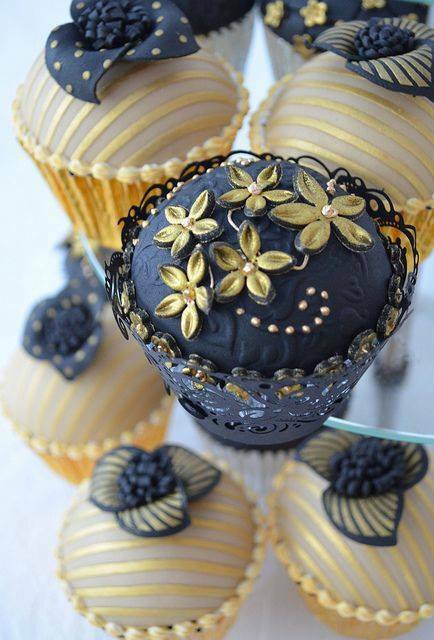 oh gold, black and craft together with this great layout, just beautiful!!! This is stunning Therese, so striking. The Delicata gold really finishes it off, love it. This card is so beautiful and elegant! Love your card, so elegant, the Delicata gold is great. Awesome use of those colors! I love the popped up flowers with the blingy centers!! So elegant and totally gorgeous!!! So stylish and just spot on!